Posted on Thursday, January 17th, 2013 at 8:07 am by Ty Anderson. It is a universal truth that sharing is a good thing. If we didn’t share, we wouldn’t have any friends. Instead of enjoying a pint with our buddies, we would live out our days locked inside four walls to write software with a few fluorescent lights and an aging computer. Wait! What? Yes, sharing is good. Good for gaining friends and good when building Office solutions. Sharing makes efficient use of assets/resources and lets us to (sometimes) escape to go for lovely dinner with our buds… or our significant other. In this article, I want to show you how you can create a single Microsoft Office 2013 and 2010 ribbon and share it with Excel, PowerPoint, and Word. This scenario is one of many where Add-in Express shines. Using the Add-in Express framework, you can easily build a shared ribbon in a matter of minutes. Best of all, you can also quickly configure your controls to display (or not to display) in the Office host applications your add-in targets. Please take note that I said configure… not code. This is largely a point and click exercise. By the end of this article you’ll better understand why we say Add-in Express tools provide a true RAD experience. Each application has a corresponding group and button. Hopefully you have guessed that the trick here is to display only the controls residing in the group matching the host app: Excel, PowerPoint, or Word. 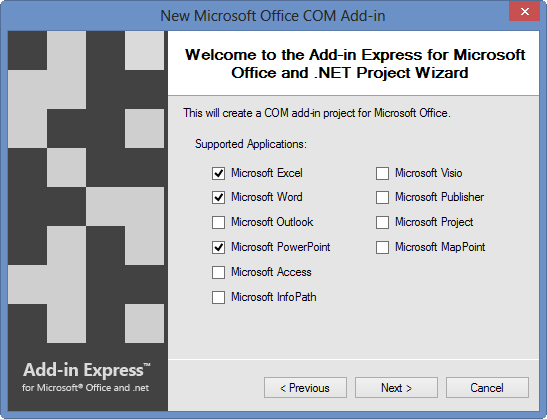 And we are going to use Add-in Express for Office and .net. Choose Excel, PowerPoint, and Word as the supported applications then click next until the Wizard closes and Visual Studio creates the project. Now, let’s build our shared Office ribbon. Open the AddinModule in design view if isn’t already done for you. Add an AdxRibbonTab component to the AddinModule’s design surface. Select the tab and change its caption to ‘Shared Ribbon’. The tab’s Ribbon property should already be set to ExcelWorkbook;WordDocument;PowerPointPresentation but go ahead and confirm. This setting is what makes it a shared ribbon. Select the AdxRibbonTab to display its visual designer in the lower half of the AddinModule. Add three AdxRibbonGroup controls to the ribbon (just click the AdxRibbonGroup button in the visual designer’s toolbar). Change their captions to Excel, PowerPoint, and Word respectively. 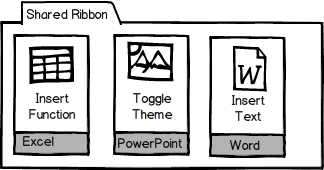 Also, set their Ribbons property to ExcelWorkbook, PowerPointPresentation, & WordDocument. The value of the Ribbons property causes the showing and hiding of the controls in the correct host apps. We need to add code to each button’s click event. The code is just for illustrative purposes. What I want you to take away here is that in just a few minutes, you can have built a shared ribbon for Office 2007, 2010 and 2013 and implemented your business logic. The Excel button (btnExcel) inserts a simple formula into the active cell. The PowerPoint button (btnPowerPoint) changes the theme of the active presentation and allows the user to toggle through various themes included with Office. Be careful with the hard coded themePath value. This path might be different on your system… especially if you are not running Office 2013. "C:\Program Files (x86)\Microsoft Office\Document Themes 15\"
Const themeName1 As String = themePath & "Facet.thmx"
Const themeName2 As String = themePath & "Integral.thmx"
Const themeName3 As String = themePath & "Ion.thmx"
Const themeName4 As String = themePath & "Organic.thmx"
Const themeName5 As String = themePath & "Organic.thmx"
The Word button (btnWord) reprises the great logic provided by the Excel button. It’s deja vu all over again… but this time, it’s in Word! Please note that I disabled some tabs using the Customize Ribbon feature. I did it for the “sake of screenshot”! I wanted it to be simple and clean. It’s like photography to a developer/writer. I need to get out more don’t I? Well I will. Now that I shared this handy technique with you… my friend.